Energize yourself and get rid of muscle soreness! Recommended after sport sessions, this massage is conducted on a special ergonomic chair. 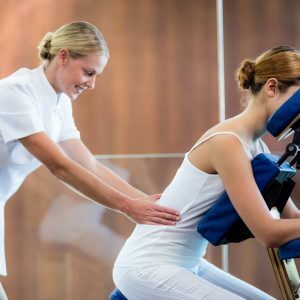 The therapist focuses on head, neck, shoulders, back, arms, hands, front of the thighs, using deep tissue and joint mobilization techniques, which aim to remedy contractures and muscle cramps, provide general relaxation or required segments and eliminate lactic acid in the muscles. Forget about discomfort with this therapeutic massage that aims the release of tensions, pains and blockages! The therapist makes slow movements using its elbows, forearms, fists, fingers to stretch, press or knead the deep muscle layers, tendons, ligaments, connective tissues. You will feel the benefit of this massage at 1-2 days after making it, when the functional capacity of muscles is restored and pain diminishes or disappears entirely. Relax, recharge and heal your body… A regular deep tissue massage is incredibly relaxing, but the addition of volcanic heated stones makes this massage a healing remedy. Hot stones helps muscles to relax and improve blood supply in areas that are applied. This massage is recommended in treating chronic or painful contractures and in recovery from repetitive work or mild injury, reducing discomfort caused by postural problems. A healing touch… This customized therapeutic massage is designed to alleviate chronic muscular pain caused by postural deficiencies, sedentariness, spinal disorders or post-traumatic sequelae. The goal of this massage is keeping the improving the state of health, healing and improving some pathological states of the human body and readapt to daily life and work . The sport massage helps the athletes to prepare the muscles for performance , to recover after an event or to have be fit during the trainings. The sport massage is also benefic to the people with wounds or chronical pains and people perfect healthy. Includes multiple maneuver from the somatic massage as from other techniques ( deep tissue, lymphatic drainage ) , applied in an intuitive way, technique that itself improves the sportive performances. The traditional Thai massage combines the chiropractic and acupuncture with acrobatic exercises of stretching of all muscles, borrowed from yoga. The final effect is the re equilibration of the four elements of the body: Earth ( body, skeleton, muscles , blood vessels, tendons and ligaments ) . Yamaimo therapy is a traditional Japanese therapy which includes a set of manual therapeutic procedures and complex physical exercises, with the goal of recovering the equilibrium, the symmetry and the correct functioning of the body.